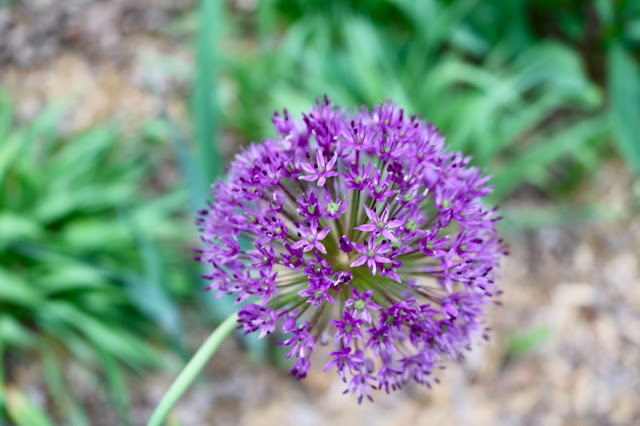 Many of my regular readers know I'm an avid gardener and I have a huge yard filled with perennial gardens. I normally photograph the garden throughout the season and post pictures of my garden almost every Sunday, but this year was difficult because we had a very late spring. 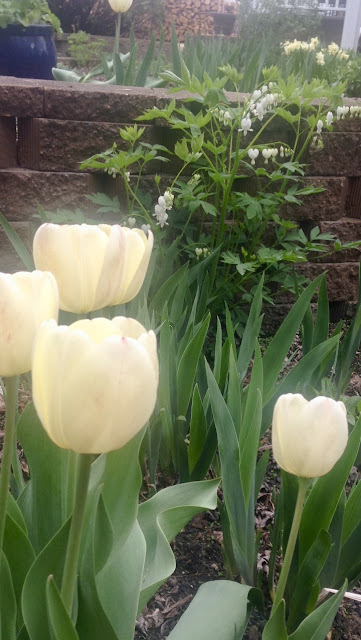 We had two major blizzards in Wisconsin in April so I couldn't even get out to my garden until May. I had such a disaster on my hands because I to chop everything down from the previous season so fast. New growth was growing up through the old growth making it very difficult. I've been so busy cutting things down, cleaning up beds, planting annuals, seeds, etc., etc., etc., that I haven't had much time for anything else let alone taking blog photos. 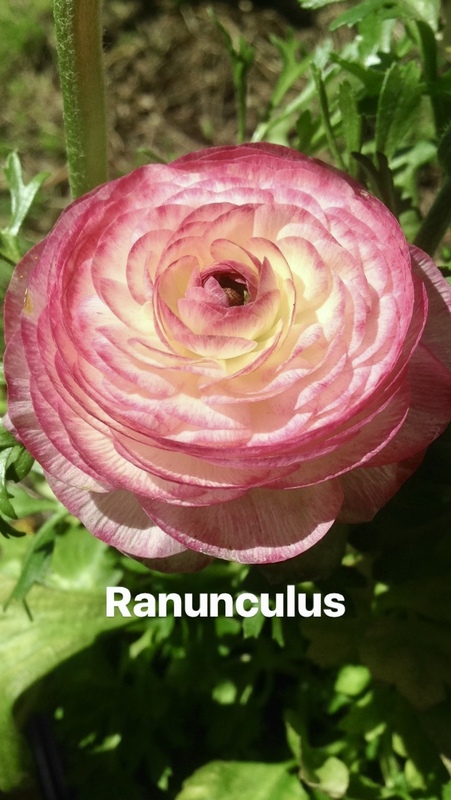 That being said, I always have my phone in the garden with me so I do occasionally take garden photos when I am in the yard and post them to Instagram or Facebook. They are not "Blog Worthy" as they were taken with my phone and not my DSLR, but here they are to give you a taste of my garden in May. 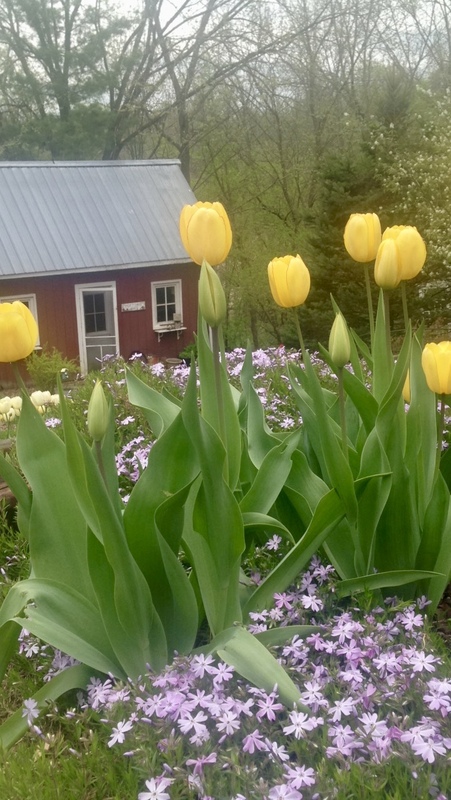 Yellow tulips growing through Phlox with the garden shed in the distance. 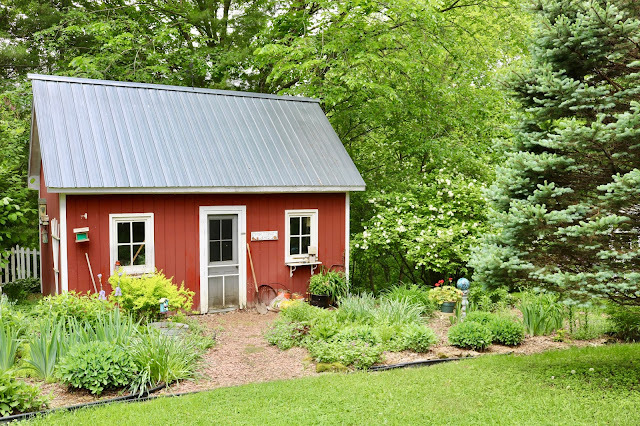 The Garden Shed, after the yellow daffodils finished blooming. Now all the Iris are in bloom...which you will see next week! These are some snap shots I took and posted to my Instastories on Instagram. 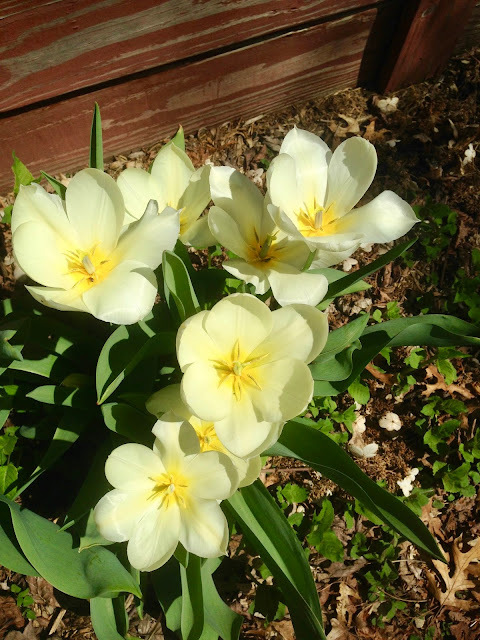 White tulips opened to the sun. 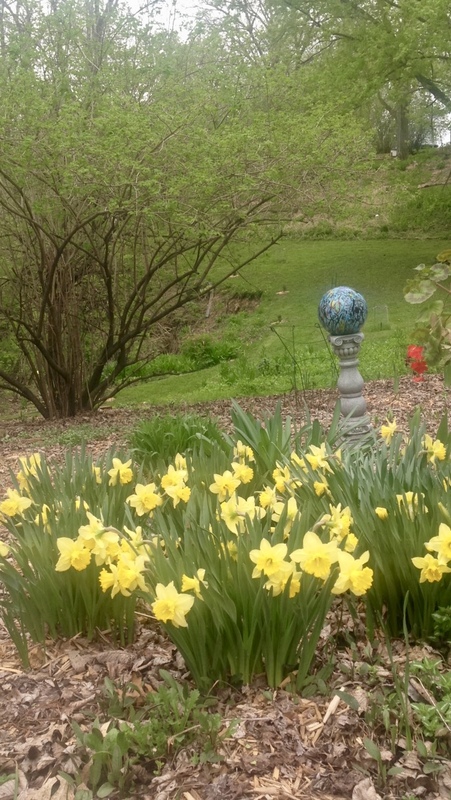 My natural hillside filled with daffodils. Now that it is June, it is covered with ferns and ivy. 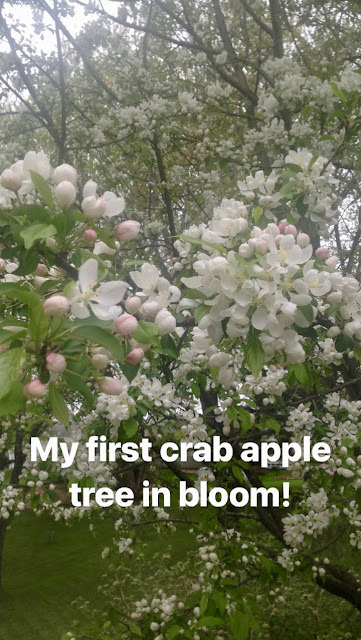 My crab apple trees were such a disappointment this year. I have four crab apple trees and only one bloomed nicely. One did not bloom at all and the other two just had partial blooms on top of the tree. 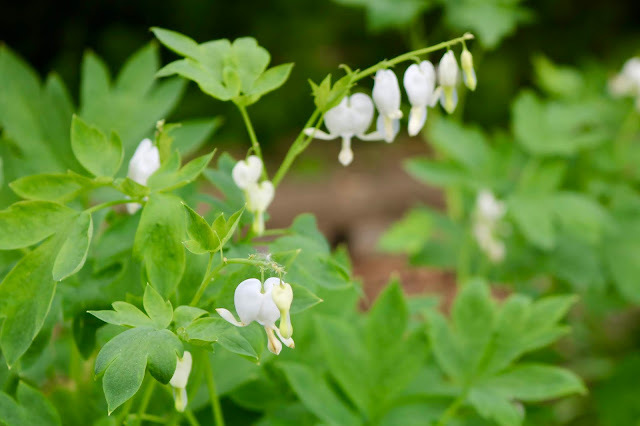 We think the lack of blooms had something to do with the late spring snowstorms. 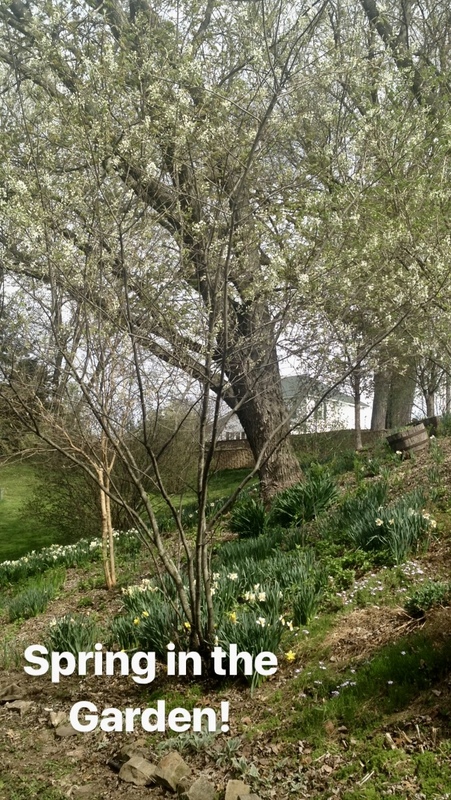 White tulips with white Bleeding Heart and daffodils in the distance. 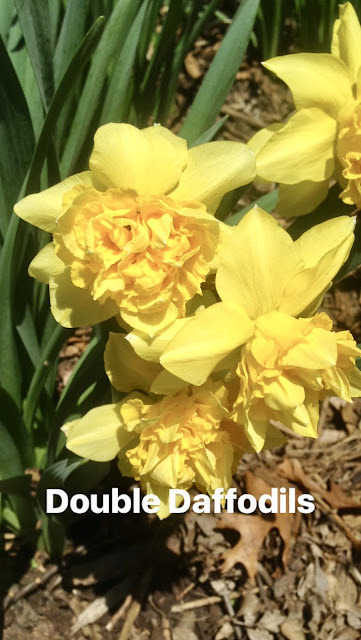 Clusters of daffodils in my large southern garden. I've had such a problem with Impatiens the past few years; either the deer eat them or they die out from a fungus. 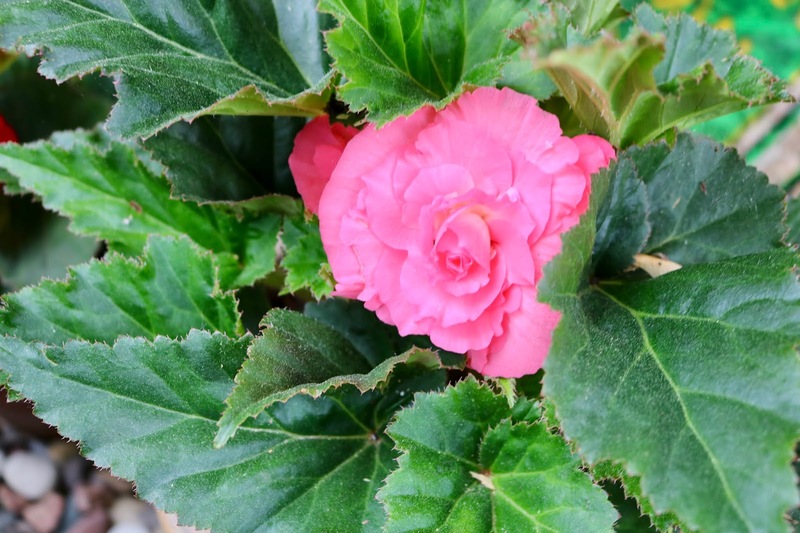 Last year I lost every single Impatiens I purchased. So this year I decided to try Begonias and they are doing very well. The deer seem to be leaving them alone too! They are more expensive, but you get a lot of bang for your buck! 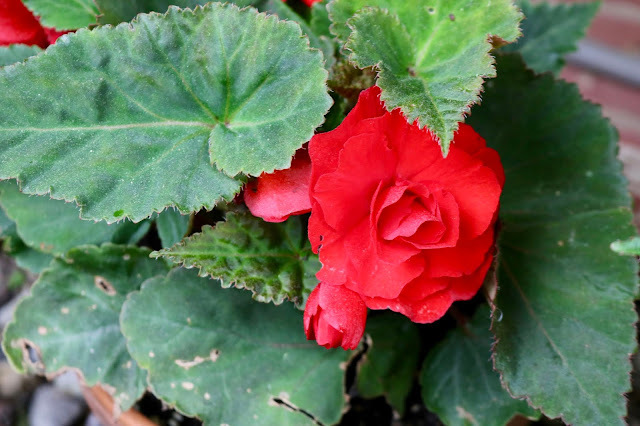 Even though a gardener's work is never done, I am feeling more "caught up" and did manage to get outside and take some pictures of my garden with my DSLR. I will show those next Sunday. When I compare those pictures to these pictures, I can't believe how much my garden has grown since then and how much more is in bloom. Even though it is a lot of hard work, my yard brings me such happiness and revives my soul. When I was in my yard yesterday I was just blown away by the beauty of the flowers and listening to the birds sing with the sound of the waterfall in the background. I love summer, and I wish it would be summer all year long! I always love your garden updates. 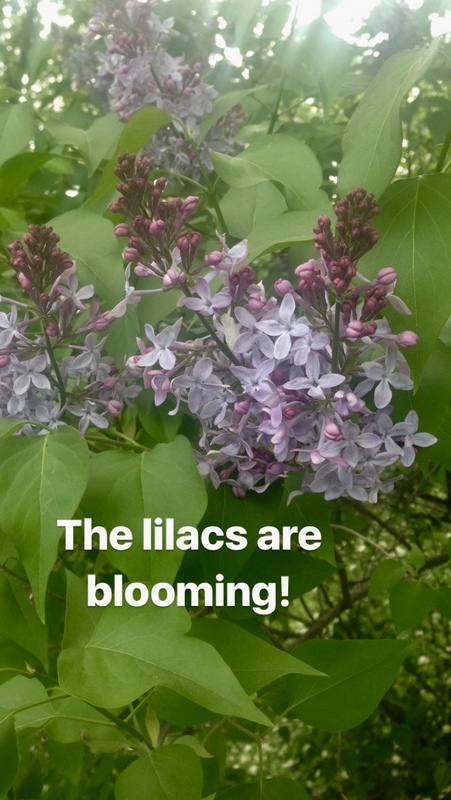 Love your lilacs. My DSLR has been sent back to Nikon with a broken lens so it's now mostly phone pics for me! We too had restrictive weather in spring, then when those few weeks if opportunity came for cutting back, hubby checked himself in to hospital and I spent all the light hours up there. So this year we've had to get gardeners in to blitz it, and they certainly have! Thank you! 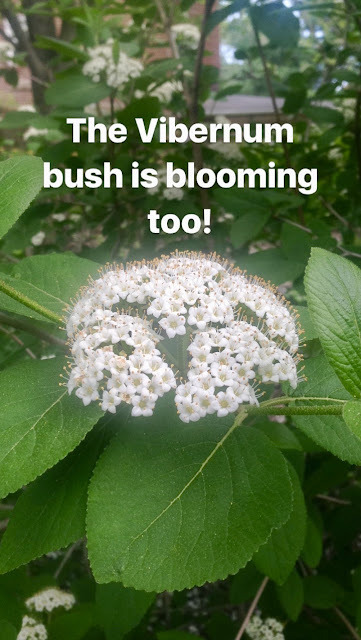 It seems like so many people had a late spring, no matter where they live. Sad to hear about your hubby. Hope he's feeling better now. I always enjoy seeing your garden posts! Beautiful flowers again this spring, even though they arrived late! Wow! That sounds amazing! And the best part would be the deer couldn't eat your plants! haha! Yes, the shed is huge...and stuffed full. My husband and I often joke we could live inside of it when we retire someday. Seeing photos of your garden makes me wish we could grow more of a variety of plants here in west Texas. Your phlox looks like dainty purple snowflakes in your garden. And lilacs remind me of my childhood. Trying very hard to grow a lilac here; please keep your fingers crossed for me. Such a beautiful space, Amy. And it represents so much hard work. That's funny you say that because when I go south or east I'm envious of all the plants they can grow that I cannot! Stitch Fix #17: I Got My Red Pants!